I first caught wind of what was going on via cable news on CNN. The network, however was not speculating on details of a pending presidential statement, so in addition to scanning other television channels one of the first things I did was ask my network on Twitter what they had heard (above). I had gotten back a variety of responses but noticed that several were indicating that they had heard something about Bin Laden being killed. Immediately I stopped and thought about what I was doing. Television was not immediate enough and too conservative when it came to getting information first hand—I was looking to Twitter for the "scoop" and television to eventually confirm it. 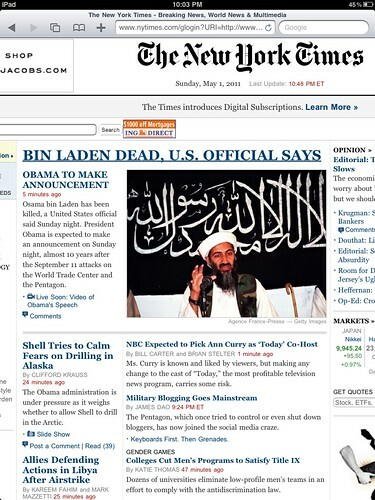 Historical events such as the death of Osama Bin Laden continue to highlight the speed and virality of media which is generated and distributed via social networks. Less than two hours after the news broke—a Facebook Page called "Osama Bin Laden is DEAD" accumulated over 150,000 likes. Multiple Twitter accounts have already cropped up including @ghostosama attracting over 17,000 followers instantly. Once again, a major global event highlights that media is no longer a broadcast activity and that social networks amplifies activity instantaneously. With so much content being generated, so quickly—there is the need for it to be selectively curated and aggregated into destinations which make it easy to digest. Platforms such as storify (see example below) help do exactly this.